Well, I don’t know what it was like then but it’s certainly got a lot happening now, with a cornucopia of great shops, bars and restaurants, you’re really spoilt for choice. And it is an easy place to lose yourself in, too. Luckily I know the road to Tredwell’s well (and my way around Covent Garden, of course). The restaurant is deceptively large with a lovely upstairs area. And one of my favourite things – booths! There’s something just perfect about settling into your own booth for some delightful dishes – which is just what we did tonight. Tredwell’s food is described as “Modern London Cooking” and perusing the menu made my mouth start to water! I’m loving British chefs at the moment, Marcus is innovative without being too weird or fussy and uses all the classic British ingredients that you would expect. 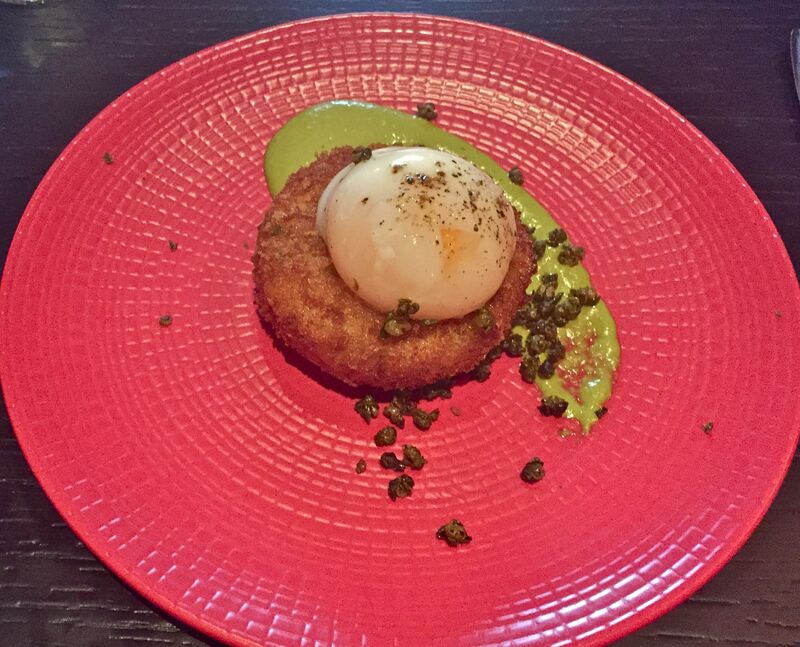 This beautiful starter – fish cake with confit egg, capers and herb mayonnaise was light and tasty, the fishcake was almost fluffy and topped with a slightly runny egg and some crunchy capers. A wonderful combination of flavours and textures. Just how exciting do you think a chef can make aubergine look? 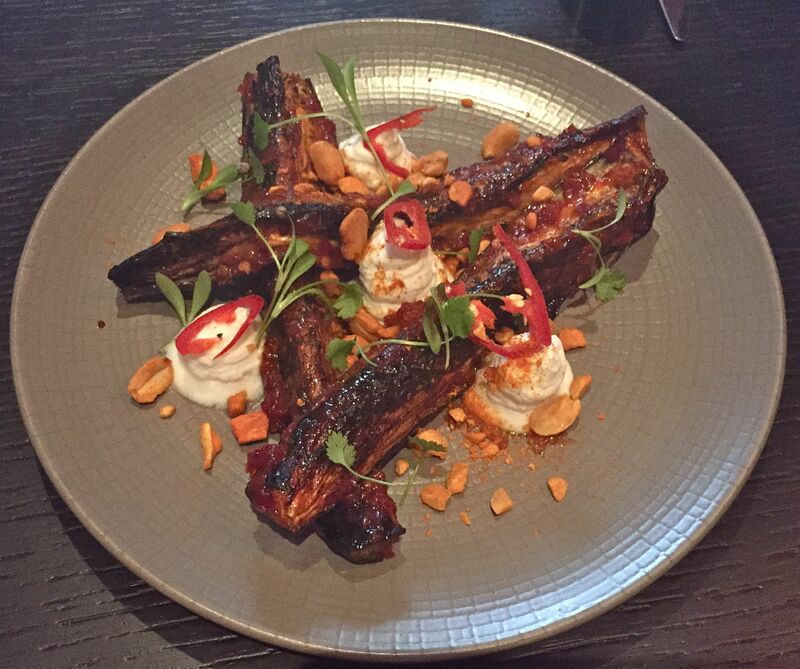 Well, this dish was pure genius – not it’s not ribs, though it certainly looks like it. The Harissa glazed aubergine had an amazing crunch and a serious chilli bite to it and was served with peanuts and coriander. 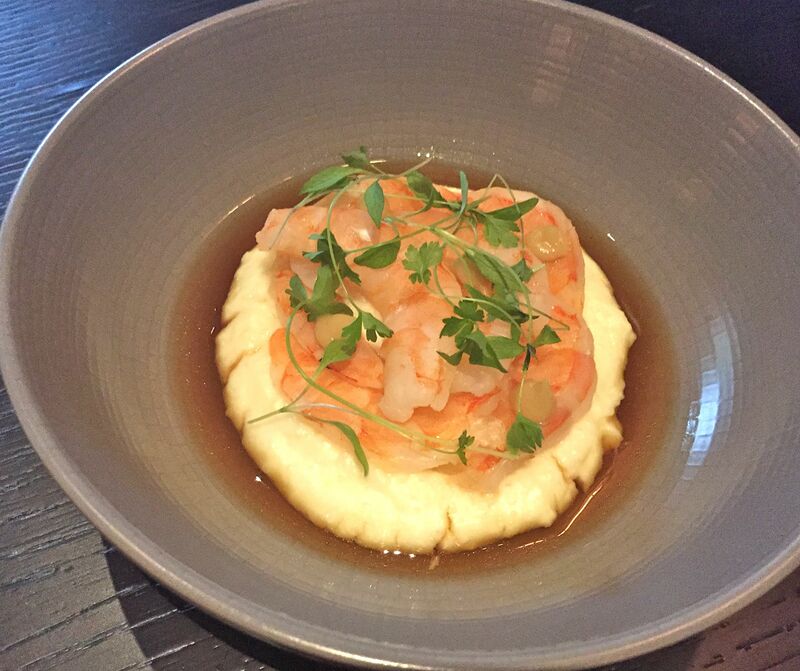 And then there was the wonderfully mouth-watering combination of prawns, white polenta, roast garlic and chicken broth. Soft food at its best. On to mains. I opted for the Saddleback pork chop from the charcoal grill section – it came with grilled shallot and mustard sauce. 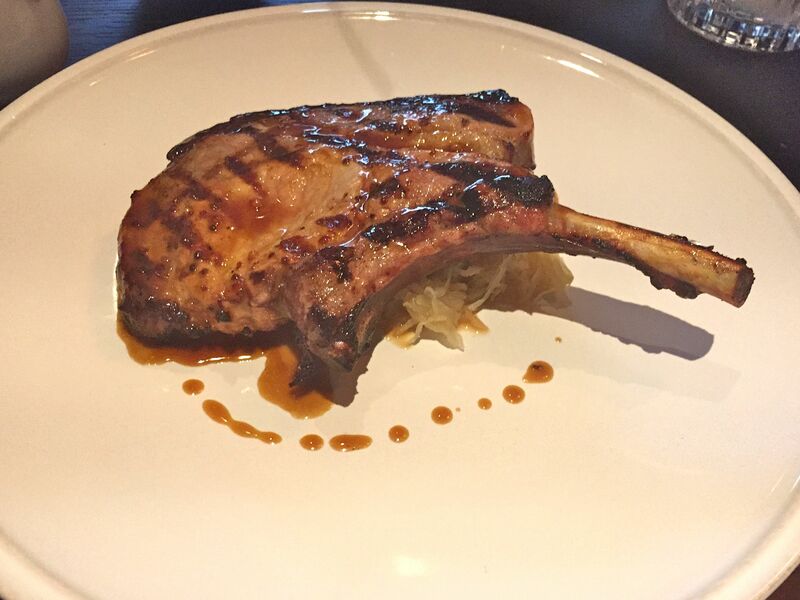 I mean, have you ever seen a pork chop looking so delicious – and it tasted just as good as it looked, perfectly cooked and packed with flavour. 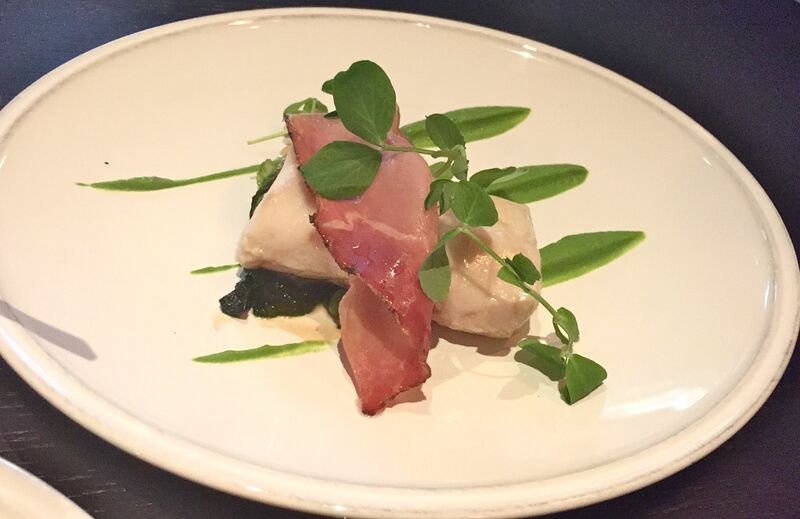 This pretty dish of poached haddock, pea, speck and braised baby gem was light and a taste of summer on a plate. 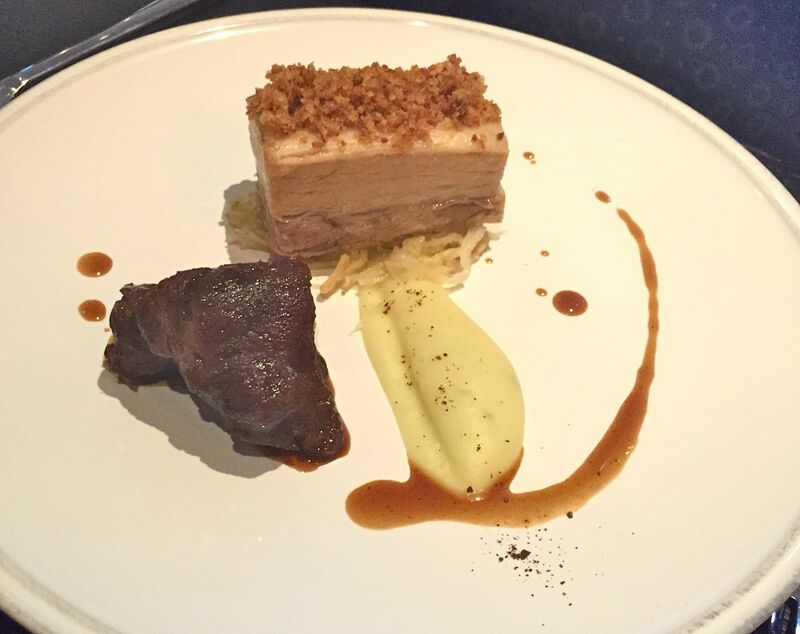 Pork was served two ways – belly and cheek, a meaty plate to savour. We ordered a couple of sides which were also delish. 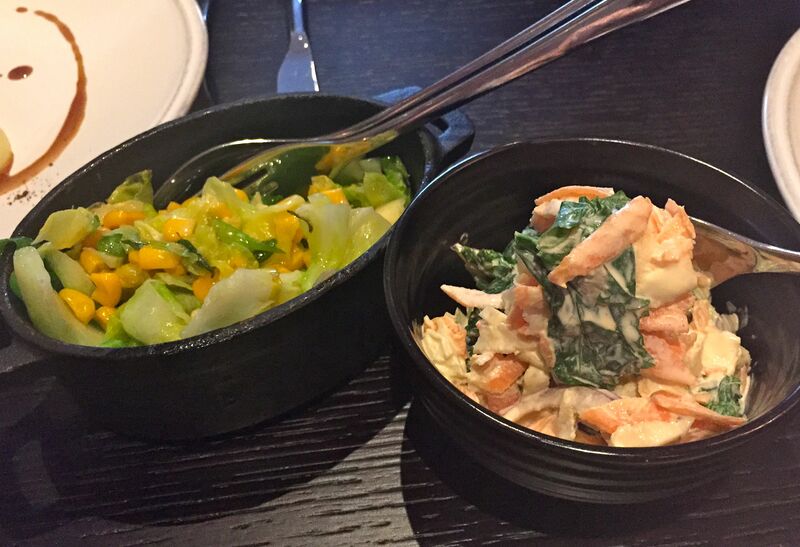 Wilted greens with sweetcorn and garlic and an unusual and tasty slaw which included kale. I loved Tredwell’s. 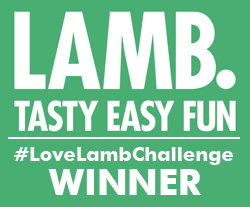 It’s got a lovely intimate feel, the service is impeccable and the food is clever with a touch of the unexpected and tastes amazing. The restaurant is also open for breakfast. Now that breakfast menu was something to behold, it could become a well worn road to Tredwell’s (with any luck). 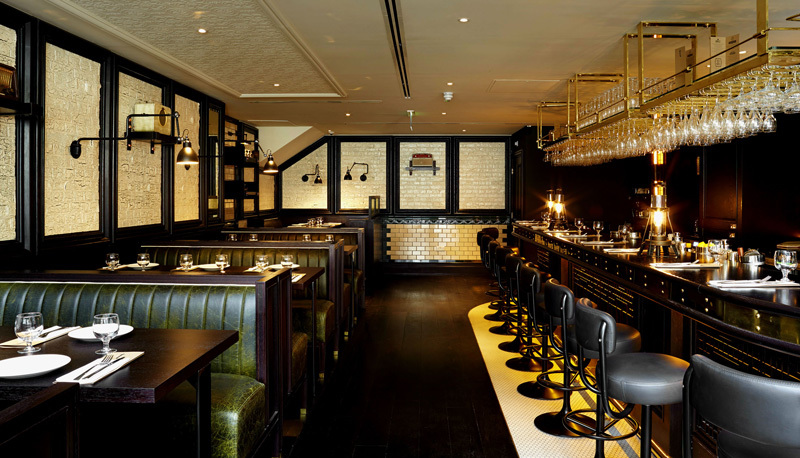 Booths and a bar – what more could you want? Tredwell’s is at 4A Upper St Martin’s Lane, Covent Garden. The closest tube is Leicester Square, just a few minutes walk away.